The binding energy of a hydrogen-like impurity in a thin size-quantized wire of the InSb/GaAs semiconductors with Kane’s dispersion law in a magnetic fieldB parallel to the wire axis has been calculated as a function of the radius of the wire and magnitude ofB, using a variational approach. It is shown that when wire radius is less than the Bohr radius of the impurity, the nonparabolicity of dispersion law of charge carriers leads to a considerable increase of the binding energy in the magnetic field, as well as to a more rapid growth of binding energy with growth ofB. The investigation of shallow impurity and excitonic states in various confined systems, such as quantum wells, quantum well wires (QWW) and quantum dots (QD) [1–3] in external magnetic and electric fields are of great interest for a better understanding of their properties, as well as for their potential application in optoelectronic devices [4, 5]. Photospectroscopy experiments, carried out on n-type GaAs in magnetic fields, have revealed transitions involving the so-called metastable impurity states . These states, associated with the free electron Landau levels, modified by the Coulomb interaction between the donor ion and electron, are known as Landau-like states . In earlier work, Zhilich and Monozon  variational procedure to calculate the energies of Landau-like states of shallow donors is used. However, this method applies only for extreme values of magnetic field. The variational method of investigating these states were developed in [9–16] as well as in  for a semiconductor with parabolic bands. At present the stage of experimental and theoretical investigations of Landau-like states in bulk semiconductors and their heterostructures, may be considered completed. Of great interest is the study of Landau-like states in low-dimensional semiconductors, since the reduction of dimensionality leads to an increase in binding energy of Landau-like states. Investigations in magnetic fields are of particular interest for understanding the basic physical properties of nanostructures, in particular, of QWW. Here, magnetic confinement potential competes with the geometric confinement potential depending on the strength and orientation of B . The magnetic length can be varied from values which are larger than the typical lateral dimensions of QWW and QD, to values which are smaller than these dimensions. The binding energy of the ground state of a hydgrogenic donor in a GaAs QWW in the presence of a uniform magnetic field has been calculated in . The calculations were performed for an axial localization of the impurity for the cases of both infinite and finite potential barriers. The calculation in [18–22] are carried out within the framework of the effective-mass approximation for the semiconductor QWW with parabolic bands. The calculations of the binding energy of the hydrogen-like impurity in magnetic field in a QWW of A 3 B 5 semiconductors with nonparabolic bands is of great interest. A 3 B 5 semiconductors usually have small effective masses, great dielectrical constant χ, which means that the Bohr radius of the impurity is larger in comparison with QWW radius achievable at present. It should be noted that the binding energy of the hydrogen-like impurity increases when the size of the confining potential is of the order or less of than the Bohr radius . The binding energy of the hydrogen-like impurity in a QWW of A 3 B 5 semiconductors has been calculated in  as a function of the radius of the wire and the location of the impurity with respect to the axis of the wire, using a variational approach. It is shown that the binding energy in Kanes semiconductors  is larger than in standard case for all values of the shift parameter. 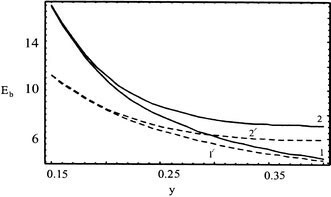 As it is known , the nonparabolicity of the dispersion law leads to a considerable increase of the binding energy in the magnetic field, as well as to a more rapid nonlinear growth of binding energy with B. The binding energy of a hydrogen-like impurity in a thin size-quantized wire of InSb/GaAs semiconductors  with Kane’s dispersion law has been calculated as a function of the radius of the wire and the location of the impurity with respect to the axis of the wire, using a variational approach. It is shown that when wire radius is less than the Bohr radius of the impurity, the nonparabolicity of dispersion law of charge carriers leads to a considerable increase of the binding energy. 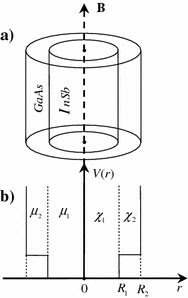 In this paper this analogy is applied for the investigation of binding energy of hydrogenlike shallow donor in a thin size-quantized wire of the InSb/GaAs semiconductors in a magnetic field, parallel to the wire axis. Calculations have been performed using the variational approach, developed in . Consider the system consisting of the semiconducting wire of radius R 1 with the dielectric constant χ1, having the coating of radius R 2 immersed in the infinite environment (Fig. 1a). where s is the parameter characterizing the nonparabolicity of bands (s≈ 108 cm/s, μ = 0.016 μ0 for InSb) and related with the forbidden bandgap E g by the relation E g = 2 μs 2 with the boundary condition Ψ(R) = 0, is chosen as . where k z is the z-component of the wave vector, ω = eB/μc. K0 (2λ ρ) is the modified Bessel function of the second order, U 2 (−a′01, 1;ξ) and 1 F 1 (α, β, ξ) is the confluent hypergeometric functions. Taking into consideration Eqs. (6)–(8), and (5) the binding energy, as well as in , is found as the difference E b (R,B) = E 01 − E i (R,B). The dependence of binding energy of the impurity in effective Rydberg R * in the InSb/GaAs quantum wire from the wire thickness in dimensionless units y 1 = R 1/a, λ → λa, α = α10 a(a is the effective Bohr radius of impurity a = 500 Å, Q = 0.6), x = α10 R = 2.4048, ρ = tR for two different values of magnetic field (B 1 = 10 T and B 2 = 40 T) are shown on Fig. 2 (curves1 and 2). The analogous curves 1′ and 2′ are for a semiconductor QWW with parabolic dispersion law GaAs/AlAs, obtained in . As follows from Fig. 2, the curves 1 and 2 as well as 1′ and 2′ coincide aty→ 0 (practically in the rangey≤ 0.1); in an infinite barrier case the binding energy diverges, wheny→ 0 for any magnetic strength. At such values of the QWW radius the binding energy of impurity is mainly determined by geometric confinement of QWW. The binding energy in the nonparabolic case is essentially greater than in a parabolic case at the same values of the wire radius and the magnetic field. Thus in units R * at y 1 > 0.4 (y 2 = R 2/a R 2 = a/2) our results are close to the results of . For the case B = 10 T, when y > 0.4 (R > 200 Å) the values of binding energies for InSb/GaAs and GaAs/AlAs semiconductor wires are actually the same. The nonparabolicity doesn’t play essential role when the radius of wire is big enough. This increase is considerable when wire thickness is less than the Bohr radius of an impurity electron (y 1 < 0.4). 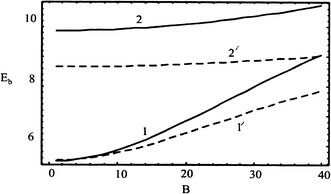 The dependence of binding energies in effective Rydberg R * on the values of the magnetic field B in InSb/GaAs quantum wire for various thickness (y 1 = 0.2, R 1 = 100 Å and y 2 = 0.4, R 2 = 200 Å) are shown on Fig. 3 (the curves 1 and 2). As on Fig. 3, the curves 1′ and 2′ are shown for a hypothetical QWW with parabolic bands, but with the same parameters as in InSb/GaAs. For a fixed value of d the binding energy in both cases increases as a function of the magnetic field due to the increasing compression of the wave function with magnetic field. As follows from Fig. 3, at one and the same value of y the growth of binding energy depending on the magnetic field is more rapid for a nonparabolic dispersion law in comparison with a parabolic case. As in  the binding energy growths more rapidly from magnetic field in thick wires. When B → ∞ the geometric confinement of QWW does not play any role and the binding energy is defined by the magnetic confinement. Fig. 3 shows that difference in binding energies for InSb/GaAs and GaAs/AlAs are more essential for a 100 Å wire than for 200 Å wire for the same value of B = 10 T. In the range B < 10 T (R = 200 Å), when the nonparabolicity is not substantial , a coincidence of the asymptotic behavior of the corresponding curves for InSb/GaAs QWW (1) and for GaAs/AlAs QWW (1′) was observed. In the range B ≥ 40 T the binding energies for 200 Å-wire (with nonparabolic dispersion law) have the same value as for 100 Å-wire (with parabolic dispersion law). At y →0, the binding energy approaches infinity E b → ∞, which is related with the choice of the infinite well model, for the wire potential. For a quantative comparison with the experimental data we used Larsen’s results  for the binding energy of shallow impurity in such a magnetic field B that creates the same confinement, as the wire potential, i.e.: . In the case when y 1 = a c /a = R 1/a = 0.2 we have obtained the following value for the binding energy E b = 8.5R *, (in InSb R * = 0.6 · 10−3 eV). In the semiconductor wire of GaAs/AlAs E b = 7.7R *. As it follows from the dependence obtained (see Fig. 2 or Fig. 3), the binding energy in Kane’s semiconductors is greater than the similar quantity in a standard case for all values of the wire radius and the magnetic field. I’d like to express my gratitude to Dr. Wang and my colleague Dr. Dvoyan for attention towards my research.